The first time a wild seed sprouted in T.J. Mabrey's clothes dryer, it irritated her. Seeds were bothersome tidbits that caught in her shoelaces or in the hem of her skirts. They were a nuisance to be brushed aside and forgotten after walks around her rural home in Lampasas County. A peek through a magnifying glass corrected her vision. Seeds and pods burst into her artistic imagination and have been lodged there for 17 years. They're objects of architectural beauty and bounty. Now she is a pod person. “When I finally saw these tiny things, I saw them as sculpture,” she said. On a recent overcast but balmy afternoon, Mabrey, a sculptor of 35 years, was tending her delightful rock garden of seeds, pods, grains and vegetables on display at the Lady Bird Johnson Wildflower Center. “Don't you want a bowl of gumbo?” she asked, eyeing the array of larger-than-life okra perched on the edge of a small garden pond. Stone soup. The whimsical okra slices do have an appetizing appeal, but as food for the eye and the mind and the soul. For that other kind of nourishment, Mabrey popped into the Wildflower Café at the center for a cup of coffee and a wrap of roasted poblanos and portobello mushrooms after installing the pentagonal pieces of okra. She saved half the wrap and a chocolate chip cookie for a lunch partner who was running late. Mabrey has strong feelings about food and its relationship to people. She is concerned about genetic manipulation of seeds and food, droughts and famines, overpopulation, sustainable agriculture and the loss of biodiversity. At 68, the diminutive artist with the big grin keeps her chisels to stone in hopes of raising awareness that nature is as fragile as it is beautiful. Look closely at the 20 or so sculptures by Mabrey on display at the Wildflower Center through March 7, 2010, an exhibit that includes paintings by Austin artist Eliza Thomas. Don't be surprised to see she has carved a bolt onto the end of a long, graceful gourd entwined with other elongated gourds of white Italian marble, an artist's statement about human control that holds on tight. And against the backdrop of a large picture window, six small barges of white marble carry precious cargo. Each boat floats a different food, including beans, squash and corn, the three sisters of American Indian agriculture that can be planted together to help sustain each other (the bean vine climbing the corn stalk with the squash offering ground cover) while providing essential nutrition. Mabrey is part Cherokee and is steeped in mythology and cultural studies. She grew up in Texas and Oklahoma, a child intrigued by the natural world, especially the moon, the stars and the large gardens tended by her maternal and paternal grandparents. She remembers pantries lined with canned vegetables and lively seed exchanges. Her grandmother tucked seeds into an apron pocket while walking in the garden. And so the marble acorn sculpted by Mabrey is adorned with small human faces on its cap. Humans, like acorns, are vessels of the future. A mashrabiya screen is a wooden latticework that allows someone to look out a window without being seen. Mabrey, who holds a fine arts degree from Oklahoma State University, saw many of them when she lived in Egypt. Her husband, Stephen, with whom she will celebrate a 45th wedding anniversary later this month, was a career foreign service officer for the State Department. In 1980, Mabrey was living in Dallas when she requested a grant from real estate developer and arts patron Trammell Crow to go to Italy to work on sculptures. He agreed and, since then, Mabrey has spent several months of each year working in a rented studio in Pietrasanta, Italy, a town on the coast of northern Tuscany 30 minutes from Pisa. There, she works without interruption on marble sculptures that she sends by ship back to Texas. She finishes the sculptures in her home studio in the rural community of Rumley, about 15 miles northeast of Lampasas. 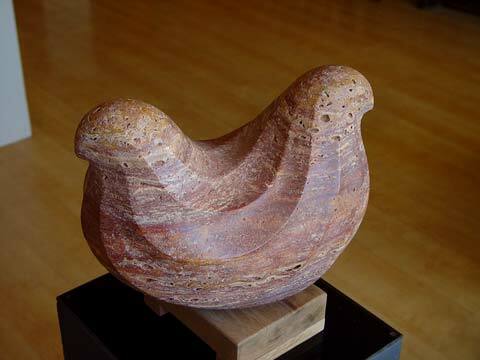 Though she has an activist spirit, her sculptures are smooth and soothing. They invite reflection and touch, and she encourages visitors to run their hands over them.